You are here: Home » Social Security Disability » Facts » How can I get disability benefits from my relative’s Social Security work record? Learn when Social Security Insurance law allows disabled adult children and disabled widows, widowers, and divorced spouses to get benefits based on their parents’ or deceased (former) spouse’s work record. Get information about the basic requirements that must be met in addition to disability. If you have a disability and have not worked enough or haven’t worked recently enough to be insured for Social Security Disability based on your own earnings record, you may still be eligible for disability benefits from the Social Security Insurance program because of a relative’s work and the Social Security taxes a relative paid. The first two requirements for you to get benefits from a relative’s earnings record are that your relative be insured for Social Security including dependents and/or survivor benefits and that he or she be either deceased or receiving Social Security Retirement or Social Security Disability benefits on his or her own earnings record. The second basic requirement is that you be an adult child or a surviving spouse or surviving divorced spouse of the insured worker. If you became disabled before age twenty-two, you may qualify for Social Security Childhood Disability Benefits (CDB) based on your disability as an adult child of an insured worker who is deceased or is receiving Social Security Retirement or Disability benefits on his or her own earnings record. If both your parents are deceased or receiving benefits, you can draw benefits from both parents under a combined family maximum benefit (FMB). To do so, file an application for benefits on both parents’ accounts. Social Security defines “child” as one born to his or her parents, an adopted child, a non-adopted, financially dependent grandchild whose parents are either deceased or disabled, or a financially dependent stepchild. Additional information about relationship and dependency requirements for grandchildren and stepchildren is available in our article Can My Spouse and Children Get Benefits If I Am Approved for Social Security Disability? To get Childhood Disability Benefits (CDB), with few exceptions, you have to be unmarried. One exception to the unmarried rule is if your marriage is to someone who is receiving Social Security benefits other than as a minor child (under age eighteen) or student-child (under age nineteen and in high school). Your spouse’s receiving Supplemental Security Income (SSI) disability benefits does not exempt you from having to be unmarried to get CDB. Unless the exception described above applies, marriage prevents or terminates entitlement to Childhood Disability Benefits (CDB). The reason is that when you get married you are no longer considered financially dependent on your parents. However, if your marriage ends, either because you divorce or because your spouse dies, you may be able to get CDB benefits again. If you are still disabled and have been continuously disabled from age twenty-two including throughout your marriage, you can file a new application using the usual child application form, SSA-4, and the adult medical and work history statements, SSA-3368, SSA-3369, and SSA-827. At the same time, submit medical information to support continuous disability since your benefits were terminated due to your marriage. To be eligible for Childhood Disability Benefits (CDB) you must prove that you became disabled prior to age twenty-two. Because you cannot become entitled to benefits until your parents begin to receive Social Security or die, you may be much older than twenty-two when you file your application. Therefore, it is a good idea to collect and store medical records from the years prior to age twenty-two so that you can prove your disability began in the required window of time. If your illness or injury has the potential for improvement or recovery, it is also advisable to keep medical records ongoing to show that disability continues without interruption. Keeping medical records for possible use in the future is also important for someone whose Childhood Disability Benefits (CDB) are ending because of marriage. As noted above, to get benefits started again after the marriage ends, you will have to prove that you have been continuously disabled since benefits were terminated. Childhood Disability Benefits vary a great deal in amount. The maximum amount when the benefits are survivor benefits on a deceased parent’s account is 75% of the amount the worker would have received at full retirement age or the amount he or she was actually receiving at death, whichever is less. The maximum amount of CDB is different when the parent is living and receiving Social Security Disability or Retirement benefits; then the maximum is 50%. However, not everyone who is eligible for CDB gets the maximum CDB. If other family dependents or survivors are eligible, the benefit could be less because your parent will have earned a certain Family Maximum Benefit (FMB) amount. This means that if you have one or more siblings who are minors or who are disabled adult children and/or your other parent or stepparent is eligible on the account, you and the other beneficiary or beneficiaries will split the amount payable within the FMB. If you are a disabled widow or disabled widower of a Social Security-insured worker, you may be eligible for disability benefits as much as ten years before you would be eligible if you were not disabled and were applying for survivors benefits based on age. This means that you can apply for disabled surviving spouse’s benefits by filing an application as early as age fifty (actually three months before to allow time for processing). The base application form is an SSA-10. To support your application you will also need to provide medical and work history on forms SSA-3368, SSA-3369, and SSA-827. Additional proofs must be supplied, the first being that you establish your qualifying relationship to the insured worker by providing proof of marriage. If you are divorced from the insured worker or you were married and divorced prior to marrying the worker on whose record you are claiming benefits, you will need to supply proof of divorce as well. Then your claim will be evaluated to see whether you meet all the other non-disability eligibility requirements. This review occurs before your claim undergoes and medical and vocational review to determine whether or not you are disabled according to Social Security law. Here are the other requirements you must meet. You were married to the deceased wage earner for at least nine months at the time of the wage earner’s death (or you meet one of the exceptions to the nine-month marriage duration). You are at least age fifty. You became disabled within seven years of the death of your spouse or within seven years of last being entitled on your spouse’s record as a young spouse with a child under age sixteen in your care. You will have to prove your disability began in the seven-year window of time referenced above, even though benefits will only begin to accrue at age fifty or twelve months before your application, whichever is later. If you became disabled a long time before you turned or will turn fifty, you may face a challenge proving that you became disabled during the seven-year window. Because it can be difficult, even impossible, to get old records, it is important to obtain and keep medical records at the time you initially became disabled or as soon as possible thereafter as well as obtaining and retaining medical records since then to show that you have been continuously disabled. What about Disabled Surviving Divorced Spouses? If you are a disabled surviving divorced spouse of an insured worker, you will be eligible under most of the same rules as widows and widowers. However, there is one major difference: you must have been married to your deceased spouse for ten years or more prior to your divorce. The other major difference is that benefits paid to a disabled surviving divorced spouse will be paid outside the Family Maximum Benefit (FMB) and will not affect the amount of benefits paid to other survivors eligible on the same worker’s record. Neither will their benefits affect the amount of your benefits. Surviving spouses benefits are reduced by a fraction of a percentage point for each month the spouse takes benefits before his or her full retirement age. This is true even if you are entitled to benefits based on disability. At the earliest possible age for entitlement to disabled surviving spouses benefits, age fifty, the benefit amount is reduced by 28.5%. In contrast, if the surviving spouse applies for benefits at his or her full retirement age, the benefit will be equal to 100% of the benefit the worker would have received at full retirement or that the worker was actually receiving at the time of his or her death. It is possible in some circumstances to be eligible for both Social Security Disability (SSDI) and either surviving spouses benefits or childhood disability benefits. If the dependents or survivors benefits are higher than the dependent’s or survivor’s own SSDI benefit, which is based on his or her own work, benefits can be paid from both accounts. The SSDI benefit will be paid first. An additional amount of CDB or disabled surviving spouses benefits will also be paid to make the two combined benefits equal to what the dependents or survivors benefits would be if SSDI were not payable. Similarly, it is possible to collect both CDB and surviving spouses benefits, although the circumstances leading to that dual entitlement are quite uncommon. As long as you have not recovered medically, you can work a limited amount while receiving CDB or surviving spouses benefits. This is possible through taking advantage of Social Security’s work incentives to earn some money to supplement your disability income. 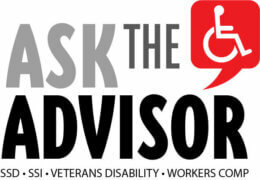 Disability Advisor’s article Can I Keep Getting Social Security Disability Benefits While I Try Working? goes into detail about when you can both work and get Social Security benefits based on disability. What If I Don’t Qualify for Disability on My Work or a Relative’s Work or I Have a Really Low Social Security Benefit? The federal government offers another disability program called Supplemental Security Income (SSI). SSI is handled by the Social Security Administration but is not Social Security. SSI does not have a work requirement for U.S. citizens and some legal aliens. This means that disabled individuals including minor children who don’t have enough work for disability benefits and cannot qualify through a parent’s or deceased spouse’s earnings record may be able to receive monthly payments. Persons age sixty-five or older are also potentially eligible for SSI. But first, whether disabled or age sixty-five, you must meet the basic financial requirements for eligibility because SSI is needs-based, public assistance program. That means to get SSI, you and your spouse if you are married and living with your spouse or you and your parents/stepparent if you are a minor child living with your parent(s) must have income and resources (assets) within the SSI limits. For example, if your Social Security benefit is less than $770 (2018 rate), you may also be eligible for federal Supplemental Security Income (SSI) disability benefits to bring your income from Social Security and SSI up to $770. (Some states pay an SSI state supplement that provides slightly higher income.) Extensive information about SSI is available in our collection of SSI articles. To determine eligibility for the Social Security dependents and survivors benefits discussed in this article or for Social Security Disability (SSDI) on your own earnings record, contact the Social Security Administration (SSA). You can start an adult disability claim online at www.ssa.gov or by calling 1-800-772-1213 to arrange a telephone or an in-person application appointment at your nearest Social Security office. You can also just show up at an office; but without an appointment, the wait can be quite long. The date you start an online application, which can be finished any time within six months, or the date you call for an appointment will be your application date. To avoid potential loss of back benefits, if any of the following applies, you should start a claim before the end of the month you are reading this article. You became disabled seventeen months ago or more and you are filing for survivors benefits as a disabled surviving spouse or disabled surviving divorced spouse or you are filing an SSDI claim as a disabled worker. You became disabled twelve months ago or more and you are applying for Childhood Disability Benefits (CDB) on the record of a disabled worker, or you became disabled six months ago or more and you are applying for CDB on the record of a retired or deceased worker. The Supplemental Security Income (SSI) application can be completed online only by adults who are also applying for Social Security Disability (SSDI) online and meet certain other requirements. Otherwise, a telephone or in-office application is required. The SSI application form, SSA-8000, and the disabled child’s medical statement form, SSA-3881, as well as other forms used to support a minor child’s disability claim are available for downloading from this site. The earliest SSI benefits will begin to accrue is the month after the month of application. To avoid potential loss of benefits, start your application before month’s end either online or with a telephone call to SSA at 1-800-772-1213. Regardless of the kind of disability benefit you are applying for and regardless of whether you plan to apply online or in person, it is a good idea to look over and complete a rough draft of the application forms before actually completing the application online or at an in-office interview. Doing so will reduce the possibility of omitting important information. If you are unsure about whether you may qualify for benefits, consider consulting an experienced Social Security attorney to assess your chances. And, always, when in doubt, file a claim to get a formal determination. For information about selection of and working with an attorney, visit When and How Do I Select an Attorney to Help with my Social Security or SSI Disability Claim? Additional information about filing for disability benefits is available in the suite of articles Applying for Benefits.